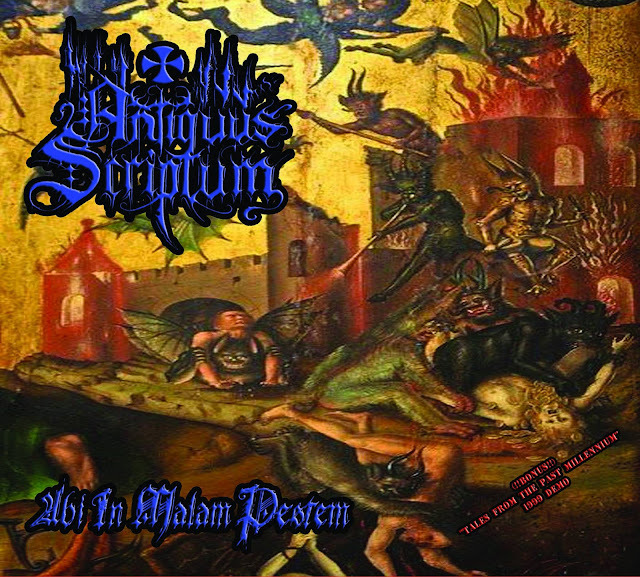 Antiquarium: "Abi In Malam Pestem" in digipack version (with new cover) through the North American Elegy Records!! "Abi In Malam Pestem" in digipack version (with new cover) through the North American Elegy Records!! "Abi In Malam Pestem" em versão digipack (com nova capa) pela norte americana Elegy Records!! Saudações do Desafio dos Campeões! 2016 tem sido de facto um anno muito generoso em termos de edições para Antiquus Scriptum, e se os antigos deuses Lusitanos da guerra e da impunidade assim o quiserem, 2017 também o será!... Tenho o prazer de aqui vir anunciar que, (depois da recente reedição da demo 'In Pulverem Reverteris' em digipack), a norte americana Elegy Records vai lançar não só o 1º álbum do projecto, "Abi In Malam Pestem" em versão digipack, também, como dará continuidade a estas reedições, indo lançar toda a discografia de 5 álbuns do projecto, todos em versão digipack e com nova arte, limitados a 300 cópias de cada. Greetings from the Challenge of the Victorious! 2016 has been indeed a very generous year in terms of issues to Antiquus Scriptum, and if the ancient Lusitanian gods of war and impunity so wish, 2017 also shall be!... I am pleased to come here to announce that (after the recent reissue of demo 'In Pulverem Reverteris' in digipack), the north American Elegy Records will release not only the 1st album of the project, "Abi in Malam Pestem" in digipack version as well, as shall continue with the reissues, and will unleash all the discography of 5 full-length albums of the project, all in digipack version and with new artwork, limited to 300 copies of each.